Royal Wolf can install a whirly bird on your shipping container to provide ventilation and cooling for areas where electricity and air conditioning is not an option. It is recommended to also install vents for optimum ventilation. Minimise odours, increase natural air flow and reduce the temperature in hot shipping containers with the installation of vents. Royal Wolf can install small vents or larger steel louvered vents on any wall of a shipping container. Accessorising your shipping container with shelving allows easy storage for items including business documents, archive boxes, tools and personal assets. Royal Wolf can design and construct shelving to your exact requirements. Royal Wolf can install a variety of different doors to suit individual needs including roller doors (ideal for vehicle access or canteen serving points), single and double side doors and sliding doors. 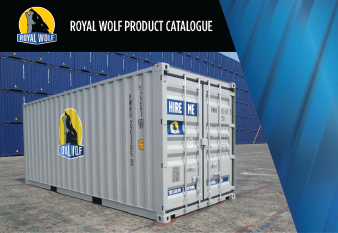 Royal Wolf can install a range of air conditioners into the shipping containers and portable buildings to ensure maximum comfort for the occupants. Specially designed in retractable frames, they make transportation easy. Painting and sign writing a shipping container allows the opportunity to promote your brand and products. Painting the shipping container not only enhances its appearance but it also prolongs the life span of the unit. Fixed or removable ramps are ideal for minimising tripping accidents where there is a large amount of pedestrian traffic. They are also useful where products on wheels need to be moved in and out and can be located at any door opening. Royal Wolf have a variety of window options available to allow natural lighting, ventilation and a clear line of sight. They can be manufactured with sliding glass panels, a steel covering flap or security bars.